Matronics Email Lists :: View topic - When / where to use dielectric grease? When / where to use dielectric grease? Posted: Tue Jan 01, 2019 9:49 am Post subject: When / where to use dielectric grease? Recently, while inspecting the engine compartment after some routine maintenance, I noted a section of "browned and crispy" wire insulation. This particular wire was one of the 3 phase wires which come from the 30A PMA associated with the engine. 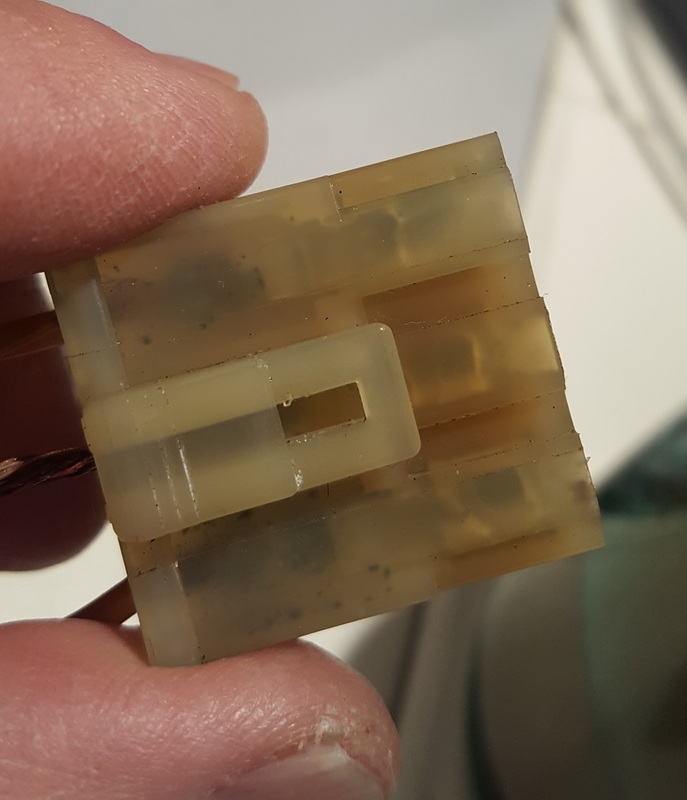 The brown and crispy portion was at the back of a plastic 6 blade connector half where crimped 1/4 female spade connectors are inserted to mate with the Regulator/Rectifier. The crimps are good, all spades firmly seated into the shell, though the spade (associated with the browned wire) location on the shell also show sign of getting too hot. But only at the one spade connection. Overheating due to high resistance is the only thing that comes to mind. I did apply dielectric grease to these particular spades to help them fully mate and as a corrosion/moisture preventative. I do this routinely on older cars up here in the Northeast with no issues. Could this be a problem? I typically draw 18-22 amps load while flying but when topping off the batteries will draw closer to 30 amps for 10-15 minutes of flying if the batteries have been drawn down for extended times during non flight activity. Note that the output from the R/R looked fine but they are a larger gauge wire. (12ga versus 14ga of the 3 phase wires into the R/R) Rather lengthy problem description for what appear to be an overheated wire, open for all thoughts or ideas. The only one I can come up with is poor connection / high resistance, though not sure of the mechanism. Thanks, Happy New Year to all!! Posted: Tue Jan 01, 2019 10:34 am Post subject: When / where to use dielectric grease? I did apply dielectric grease to these particular spades to help them fully mate and as a corrosion/moisture preventative. I do this routinely on older cars up here in the Northeast with no issues. Could this be a problem? I routinely draw 18-22 amps while flying but when topp! Just to mention that "dielectric" means "insulating". Don't know if this is a problem, but gas tight metal to metal is key. Rather lengthy problem description for what appear to be an overheated wire, open for all thoughts or ideas. The only one I can come up with is poor connection, though not sure of the mechanism. the quality of the crimp. Posted: Tue Jan 01, 2019 12:54 pm Post subject: Re: When / where to use dielectric grease? Posted: Tue Jan 01, 2019 5:45 pm Post subject: Re: When / where to use dielectric grease? Most common grease is dielectric. Its use should not cause a problem. A properly crimped joint forces all grease out from between the metals. I have coated automotive battery terminals with grease and the vehicle still starts fine. The problem is due to a bad crimp. Posted: Tue Jan 01, 2019 6:42 pm Post subject: When / where to use dielectric grease? Dielectric Grease is Silicon based all 100% synthetic. Automotive greases, and oils for that matter which are NOT 100% synthetic, and there should not be any 100% synthetics. [Yes, I know they advertise 100% synthetic but unless something has changed no, engine oil is 100% synthetic.] Petroleum Oils & Greases will trap moisture! Just like the water that is found in your engine oil. The axle grease on the battery terminals will work for a long, long time. It is just not the best way to attack the issue. Do you really need to go the route of the Ultimate Silicon Dielectric Grease path? Well, not for a automotive battery terminal. BUT! For the whole $1.00 for a Permatex packet - YES - That is the way to go. And when using the dielectric grease on terminals of different metals:- copper, silver, gold, tin, solder and mixtures of them, why take a chance of corrosion. After all, we know automotive oils do become acidic! The posted question on WHY use dielectric grease especially since the term dielectric means Non-Conductive. GREAT QUESTION! Slop on the dielectric grease to the point of just becoming sloppy. THEN complete the connection... Fast-On connectors just slide them together. As they push together the CONTACT POINTS will make both a mechanical and an electrical contact pushing the dielectric grease out of the way. YET! The grease will be in enough places to create a oxygen and moisture barrier. DON'T think you solved the problem for ALL time. The dielectric grease will migrate and become washed off, by YOU - When you wash the plane or use engine de-greasers or fly through rain. Use it... Then re-use it when you cannot see the nice coating you original put on. Joe - You said it! BAD CRIMP! Yup, I agree 1,000 %. Wrong size terminal. Wrong size wire for the terminal. Wrong type wire used. Wrong TOOL used for the crimp. 1 - Put Dielectric Grease - IN - the terminal BEFORE CRIMPING. 2 - Dip the wire into Dielectric Grease. 3 - Assemble and then CRIMP. There were no issues of a resistive connection. Yes, I do believe in dielectric grease. And, it's great for keeping your hair in place on dry staticky days. Posted: Wed Jan 02, 2019 4:38 am Post subject: Re: When / where to use dielectric grease? Posted: Wed Jan 02, 2019 4:36 pm Post subject: Re: When / where to use dielectric grease? OK, had a chance to remove the wires from the connector shell. I would like to think all my crimps looked like the "good looking crimp and wire" I cannot imagine I would have proceeded without having them otherwise. But... the other wires look pretty p*ss poor! The bare wire had hardened insulation which I peeled off to inspect wire condition. Seems like a lot of corrosion for such a "young" connection! In reading Bob's related reply, I can easily be lead to believe that those (my) crimps are in the "neophyte" category for these particular terminals. I cannot recall the crimp tool name I used, but it is oe I purchased from SteinAir expressedly for doing open barrel crimps. Thoughts, insights, and opinions?? Posted: Thu Jan 24, 2019 3:25 am Post subject: Re: When / where to use dielectric grease? There's a lot of chatter about the use of dielectric grease. Permeate suggests that Dielectric Tune-Up Grease is a good barrier to oxidation at plugs, connectors and terminals. There are some online comments at forums that say not to place dielectric grease on connector pins. "Protects electrical connections and wiring from salt, dirt and corrosion. Extends the life of bulb sockets. Prevents voltage leakage around any electrical connection. Also prevents spark plugs from fusing to boots. Required for modern high energy ignition systems." Directions for Connectors: 1. Make sure ignition system is off. 2. Clean surface with Permeate Contact Cleaner. 3. Coat both parts of terminal contact with Dielectric Grease. 4. Reassemble, maintaining metal-to-metal contact. The "metal-to-metal contact" reference may create suspicion for some about "Dielectric Tune-Up Grease". I've used this product for years around tune-up work without reservation. I searched around and found an engineer's assessment of dielectric grease that suggests Permatex Dielectric Tune-Up Grease should work well on a variety of pin connector materials without creating any kind of resistance or barrier to current flow. This commentary is worth reading: http://www.w8ji.com/...tive_grease.htm, the author seems well informed, experienced, and he uses a scientific approach. According to the engineer, metal-to-metal pin contact should result if pins are clean and not tarnished, with or without dielectric grease on the pins. It's realistic to presume that the degree of conductivity is governed by the tension of the pin and socket fit, not whether we use dielectric grease. Whether or not you use the dielectric grease, I would use a quality electrical contact cleaner to get rid of the oozing material at your PCM plug and terminals. Make sure you flush out all residue and allow complete evaporation to prevent dilution of remaining grease or any issues with spark arc hazards. I would at least place dielectric grease on connector lips to act as an effective moisture and oxidation barrier. Electrical engineering is a professional engineering deals with the study and application of electricity, electronics, and electromagnetism. Posted: Fri Jan 25, 2019 10:46 pm Post subject: When / where to use dielectric grease? 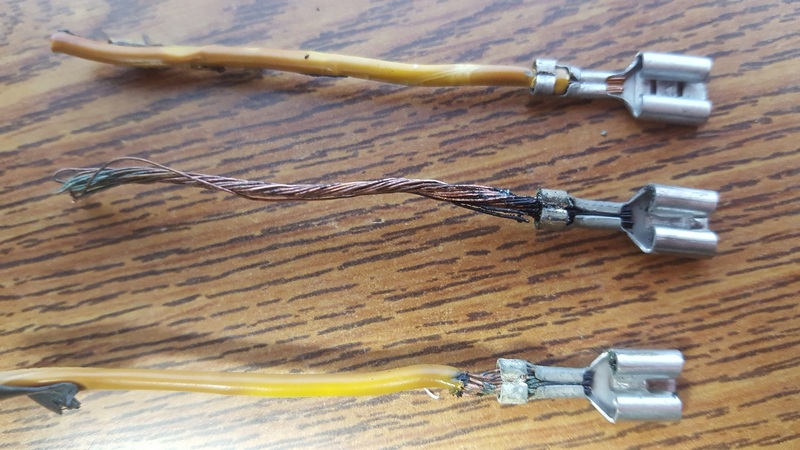 less corrosion problems on connections treated with dielectric grease. designs to being reliable connectors. understanding and feeling are the concomitants of failure in our system. admire the quality of the first they love the produce of the second. > forums that say not to place dielectric grease on connector pins. > fusing to boots. Required for modern high energy ignition systems." > Directions for Connectors: 1. Make sure ignition system is off. 2. � manage on its own. � squeezed out of a tube or brushed on from a bottle. � exposed to Kansas climate way up in the air. � allowing ingress of moisture. � performance in harsh environments. � connector is one example. � applied protection against moisture. � problem is that it's seldom necessary/beneficial. � instances of extra-ordinary risk . . .
� like difficult-to-access 175' up on a tower. � the circumstances of the failure. � the enclosure need refurbishment? � a band-aid on a marginal design. Posted: Sat Jan 26, 2019 3:48 pm Post subject: When / where to use dielectric grease? treaties required the tails chopped off. � the interior a few years back. � Monthan 'bone yard' . .
� fuel and a grease job.